Rouge Deluxe: Operation Use It Up! 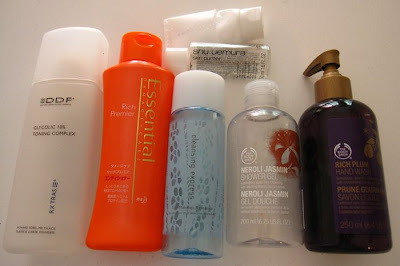 Managed to use up another batch of products in August :-) I have enough bodycare products to last me well into 2011, which is why I'm staying far far away from the ongoing Body Shop warehouse sale at Suntec! 1. RMK Creamy Soap N: This is the second deluxe sample tube that I've used up. Although it lathers well and leaves skin thoroughly cleansed, I would not purchase it as it stings the eyes. 2. Shu Uemura High Performance Cleansing Oil Fresh: A true classic, this literally just melts everything off. 3. DDF Glycolic 10% Toning Complex: I had high hopes for this in helping to prevent acne breakouts but it didn't really do wonders for me. 4. Essential Damage Care Rich Premier conditioner: This was excellent for softening and detangling my chemically-treated hair. 5. Cleansing Express Eye Makeup Remover: Very effective at removing eye makeup without stinging the eyes. The full size bottle lasted me about two months. 6. Body Shop Neroli Jasmine Shower Gel: Typical of Body Shop's shower gels, this has a soft floral scent and lathers very well. It can be a tad drying. 7. Body Shop Rich Plum Hand Wash: Love the rich fruity scent of this hand wash. If it is re-released for the holiday season this year, I'm definitely stocking up! Acne control products never seem to deliver their promises...In fifteen years of fight against acne (I have it since I was 10! )the best line I found is Neostrata/Neoceuticals. speaking of body care, do you know if soap and glory has arrived in singapore? i just read about this news from cleo last night and wanna share with you here. heard there are great products from this line but not sure what are those, any favorite from this line? anyway enjoy! I checked the Sephora stores in Ion and Ngee Ann City last week but neither had Soap & Glory yet. I also read about it in Her World so hopefully it will arrive later this month. Or you can try asking Sephora on their Facebook page. I don't really know where to post this question, but I'm hoping I can get an answer here! Cream foundations are usually launched in August-September for the fall/winter seasons. There are two main periods for foundation launches in Asia: March-April for the spring/summer and August-September for fall/winter.